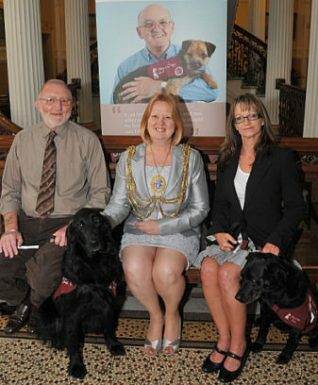 Local representatives and members of the charity group, Hearing Dogs for Deaf People, together with dogs and their owners, were invited this week by the Mayor of Brighton and Hove, Councillor Anne Meadows, to join her for tea in the Mayoral Parlour. The charity’s main work is the training of hearing dogs who will alert their deaf owners to important sounds and danger signals in everyday life. Hearing dogs help their owners to have greater confidence and independence, as well as becoming valuable and well loved companions. Deafness can be a very isolating disability and ownership of a hearing dog can be a literally life-changing experience for owners. The dogs are trained to alert their owners to be aware of sounds around them like the doorbell, or the telephone, or smoke alarm. When owners and dogs are out and about in public places, the dogs are easily recognisable by their distinctive burgundy jacket and lead slips, which help to identify the recipient’s otherwise ‘invisible’ disability, bringing increased peace of mind for the deaf person. 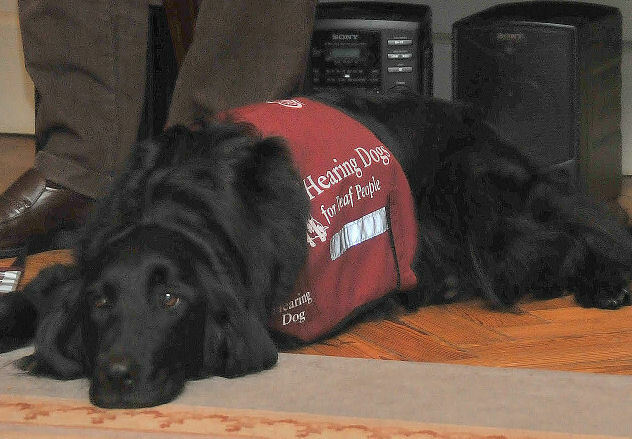 If you would like to find out more about Hearing Dogs you can visit their website here.